At least two opposition leaders in Russia’s republic of Ingushetia have been arrested on charges of attacking police shortly after being released from detention following protests against a divisive border-change deal. 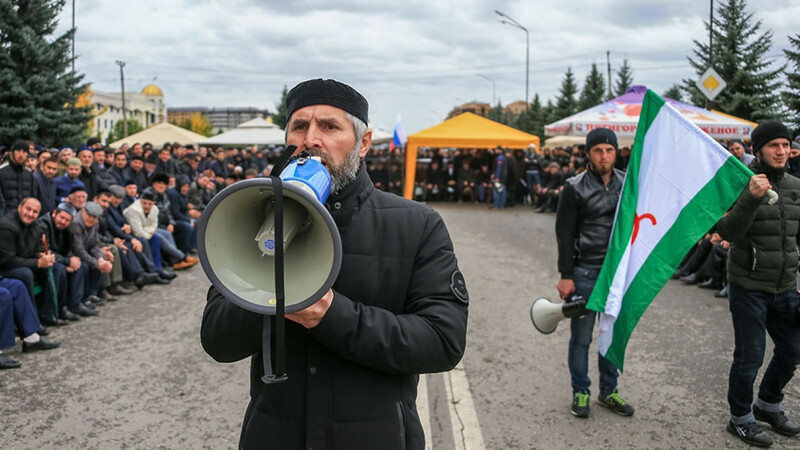 Thousands took to the streets in Ingushetia last month over a land swap deal signed last fall with the neighboring republic of Chechnya in protests that occasionally turned violent. At least three organizers of the unauthorized protests — Akhmed Barakhoyev, Musa Malsagov and Barakh Chemurziyev — have each served 10 days behind bars. Instead of being released, however, Malsagov and Chemurziyev have been detained again on suspicion of using force against law enforcement and calling for mass riots, the regional Caucasian Knot news agency reported on Saturday. Barakhoyev, an Ingush elder and protest leader, had also been detained on suspicion of using violence against law enforcement, the outlet said. All three had been placed behind bars for two months, the Caucasian Knot reported separately on Sunday. On Monday, Ingush human rights activist Magomed Mutsolgov said law enforcement officials had surrounded his home and office. “I guess it’s my turn to experience the brutality of [Ingush governor Yunus-Bek] Yevkurov,” he wrote on Facebook. Chechnya and Ingushetia signed the controversial border-swap agreement on Sept. 26, 2018. Some estimates have shown that Ingushetia, already Russia’s smallest region, gave up 26 times more territory than Chechnya in the deal. Official opening ceremony of the XI International Forum Atomexpo 2019 took place in SochiRussia’s Rusal to Build Aluminum Plant in U.S.